YellowAirplane.com: P-38 Lightning Model Airplane World War 2 Military Aircraft. 1/48 Scale 1/32 Scale Diecast Display Model Airplanes. P-38 Lightning Model Airplane World War 2 Military Aircraft. 1/48 Scale 1/32 Scale Diecast Display Model Airplanes. WW2 P-38 Lightning Scale Aircraft Section. World War 2 Military Aircraft Model Department. Military 1/48 Scale Diecast Aircraft Models for Display or Play. Lockheed P-38 Lightning fighter aircraft diecast models. 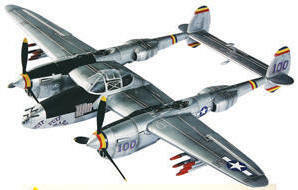 These 1/48 Scale diecast models show the P38 Lightning World War 2 Fighter Aircraft in it's finest detail. Not only are these diecast aircraft fun to look at and play with, they are historical markers showing the history of the P-38 Lightning and the history of the P-38's Squadrons, Pilots, Crews, Missions, and Markings. Keeping this historical information in our eyes keeps the history of our soldiers in our minds. Why did these famous pilots fight for our nation and what liberties did they give to all or our citizens, liberties that we enjoy today. The Soldiers of World War 2 and all subsequent wars and even in peace time, give us our right to speak our mind about our government without reprisal of criminal actions. This is why this is a government of the people, for the people and by the people. We owe all Veterans a huge word of gratitude every day for all that they have done for every one of us. The P-38 Lightning was built by Lockheed during WW2. The P38 Lightning is 37' 10" long and has a wingspan of 52' 0". The P-38 Lightning used two Allison V-1710-27/29 engines each having 1150 hp giving the airplane 2300 hp total. The max speed of the P38 is 395 mph. Gary Velasco. Reproduction of Maj. Thomas B. McGuire's nose art from "Pudgy IV." Maguire flew for the 431st Fighter Squadron, 475th Fighter Group and scored 38 victories, second only to Maj. Richard Bong. Maguire's favorite fighter was the P-38, and this art is from the 4th of his 5 P-38s. The yellow kill tally box did not appear until after he arrived in the Philippines. 30"x 22" panel comes ready to hang. Gary Velasco. Hand painted, authentic reproduction of the nose art of Maj. Richard Bong's P-38. Panel is a scaled-down version of the real thing and is made of two-piece aluminum construction. Ready to display on the two attached D-ring hangers. 30"x 22". Perfect for your lawn, garden or patio, this rendition of a P-38 Lightning is actually a "wind spinner" yard sculpture whose propellers spin in even the slightest breeze! Made of SolarMax UV-resistant nylon with molded metal and plastic fittings for the utmost in quality and durability, it measures 28" long and includes a pole, a ground stake, and assembly instructions. Featuring a P-38 Lightning along with a nose art-style pin-up girl and 20th Fighter Group and 8th Air Force insignia, this 24-gauge steel sign, die cut in the shape of a pilot wing, features a distressed look and rounded corners. An Historic Aviation exclusive, it measures 34"x 10" and includes mounting holes. Featuring a P-38 Lightning along with a pin-up girl worth fighting for, this 24-gauge steel sign, die cut in the shape of a pilot wing, has a distressed look and includes mounting holes. 34"x 10". Featuring a detailed color profile of a P-38J Lightning flown by the 20th Fighter Group in World War II, this 24-gauge steel sign also includes 77th Fighter Squadron and 8th Air Force insignia. Hand distressed to create the look and feel of aged metal and paint, it is made in the USA and includes mounting holes. 18"x 12". Featuring a P-38 Lightning with a sultry pin-up girl of the type that inspired so much World War II nose art, this 24-gauge steel sign is hand distressed to create the look and feel of aged metal and paint. 18"x 12"; includes mounting holes. Featuring P-38 Lightnings (which were manufactured on twin production lines at the Lockheed plant in Burbank, California) flying over the Golden Gate bridge, this 24-gauge steel sign is hand distressed to create the look and feel of aged metal and paint. 12"x 18"; includes mounting holes. The twin-engine P-38 Lightning, a radical design conceived by Lockheed design genius Clarence "Kelly" Johnson in the late 1930s, became one of the war's most successful fighter planes, serving in Europe and the Pacific. About 10,000 of the planes were built, and about 32 complete or partial airframes are believed to still exist, perhaps 10 in operational condition. the "Jack" nose art of Squadron Commander and former POW Maj. Carl Jackson USAAF 20th Fighter Group. I have something to say about the instructors who trained our fighter pilots that fought the Japanese at Ie Shima and Okinawa in WW2. I was stationed aboard a supply ship that was anchored close enough that we could see the island of IeShima. We were at our battle stations constantly because we were being attacked by the Japanese suicide planes. I witnessed the pilots of the P-47s the P-51s-and later the P-38s as they returned from protecting our bombers during missions to Japan. When a pilot was credited with a Zek kill he was allowed to put his fighter plane through aerobatics before landing and it appeared there must have been competition among these pilots. I say that because it would be impossible for me to describe to you how great these young pilots were doing their thing above the Island of Ie Shima and Okinawa and they seemed to want to out do each other. I often wondered how their fighter held together. They had to be well trained to down the Japanese Zeros and also to get that kind of performance out of their fighter planes. They put on a great exhibition and we always enjoyed watching them. I know they were a credit to their country and also their instructors. Well trained pilots had a greater chance of staying alive. ف 38 البرق النموذجي الطائرة الحرب العالمية 2 الطائرات العسكرية. 1 / 48 مقياس Diecast النموذجي الطائرة. P-38 Лайтнинг Модел Самолетни световна война 2 Военни самолети. 1 / 48 везна Diecast модел самолет. P-38 Model Rayo Avi Guerra Mundial 2 avions militars. 1 / 48 Escala Diecast aeromodelisme. P-38 Lightning Model avionsku svjetskog rata 2 vojni zrakoplov. 1 / 48 Omjer Diecast Model avionsku. P-38 Lightning Model Airplane 2. světov vlky vojensk letadla. 1 / 48 Měřtko Diecast Model Airplane. P-38 Lightning Model fly World War 2 militrfly. 1 / 48 Scale Diecast Model fly. P-38 Lightning Model Airplane World War 2 Militaire vliegtuigen. 1 / 48 Scale Diecast Model Airplane. P-38 kidlat Model Airplane World War 2 Military sasakyang panghimpapawid. 1 / 48 scale Diecast Model Airplane. P-38 Lightning Model Airplane World War 2 sotilaslentokoneen. 1 / 48 Scale Diecast Model Airplane. P-38 Lightning de modle mondial War 2 avions militaires. 1 / 48 Scale Diecast type d'avion. P-38 Lightning Modell Flugzeug World War 2 Military Aircraft. 1 / 48 Scale Diecast Modell Flugzeug. P-38 Lightning Model Airplane Παγκόσμιο Πόλεμο 2 στρατιωτικών αεροσκαφών. 1 / 48 Κλίμακα Diecast Model Airplane. P-38 לייטנינג דגם מטוס מלחמת העולם 2 מטוסים צבאיים. 1 / 48 קנה מידה Diecast דגם מטוס. P-38 लाइटनिंग मॉडल वायुयान विश्व युद्ध 2 सैन्य विमान. 1 / 48 स्केल Diecast मॉडल वायुयान. P-38 Lightning Model Airplane Perang Dunia 2 Militer Aircraft. 1 / 48 Skala Diecast Model Airplane. P-38 Lightning Modello Aereo Guerra Mondiale 2 Aerei Militari. 1 / 48 Scale Diecast Modello Aereo. P - 38 라이트닝 모형 비행기 2 차 세계 대전 군용기. 1 / 48 스케일 다이 캐스트 모형 비행기. P-38 Zibens modelis Lidmaīna Pasaules kara 2 militārās lidmaīnas. 1 / 48 Mērogs Diecast modelis Lidmaīna. P-38 Lightning Modelis Lėktuvas pasaulinio karo 2 Kariniai orlaiviai. 1 / 48 Mastelis Diecast Modelis Lėktuvas. P-38 Lightning Model Airplane World War 2 Militrfly. 1 / 48 Scale Diecast Model Airplane. P-38 Lightning modelarzy Świat War 2 Wojskowe Zakłady Lotnicze. 1 / 48 Scale Diecast modelarzy. P-38 Lightning Model Airplane World War 2 avies militares. 1 / 48 Scale Model Airplane Diecast. P-38 Lightning Model de Avion razboi mondial 2 avion militar. 1 / 48 Scara Diecast aeromodele. С-38 Молния Типовой Самолет мировой войны 2 военных самолета. 1 / 48 Масштаб Diecast Типовой Самолет. П-38 Лигхтнинг Модел авионску светског рата 2 војни авион. 1 / 48 Скалирај Диецаст Модел авионску. P-38 Lightning Model Airplane 2. svetovej vojny vojensk lietadl. 1 / 48 Mierka Diecast Model Airplane. P-38 Lightning Model Letalo 2. svetovni vojni vojako letalo. 1 / 48 Scale Diecast model Letalo. P-38 Modelo Rayo Avin Guerra Mundial 2 aviones militares. 1 / 48 Escala Diecast aeromodelistas. P-38 Lightning Modell Flygplan vrldskriget 2 militrflygplan. 1 / 48 Skala Diecast Model Airplane. З-38 Молнія Типовий Літак світової війни 2 військові літаки. 1 / 48 Масштаб Diecast Типовий Літак. P-38 Lightning Model bay Thế chiến thứ 2 my bay qun sự. 1 / 48 Quy m Diecast Model bay.